Are we moving forward or backward? Technology appears to be touching every part of our lives while moving and changing even faster and faster. Disciplines are collaborating and creating a cross-pollination effect leading to biological designs for home and fashion, as well as other creations that once seemed so far-fetched and are now reality, or very close to realization. In contrast to this we have strong tendencies reaching back in time and embracing craftsmanship and unique products entrenched in authenticity. The influences for 2014/15 are here for Heimtextil and beyond. Get inspired with the September edition! Multiple European Cities — The fall trade show season has officially commenced, starting with Tendence in Frankfurt, Germany. In this issue we bring you coverage hot off of the trade floor in addition to exclusive previews of trends and product innovations you will find at future exhibitions like Designjunction, Heimtextil, and MoOD. Also enjoy a gallery full of next textile directions from across Europe. 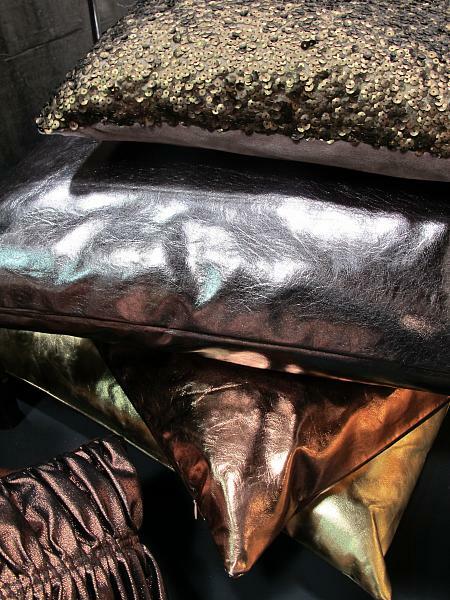 Frankfurt — The concept of contradictory forces outlines the influences and framework behind the Heimtextil Trends for 2014/2015. The Heimtextil Trendtable, this time led by FranklinTill, has shared its preview for the trends to be presented in January 2014 during the exhibition. The two contra themes are broken into four directions: Progress with Generate Collision and Engineer Nature, plus Revive with Exalt Purity and Rejuvenate Craft. Frankfurt — Did you ever imagine that tissue engineering and biotechnology would be the framework creating the latest textiles? Nature is being manipulated and engineered by designers and collaborators to replicate natural processes, leading to future fabrics. A trend that may seem far-fetching is without a doubt forthcoming. Frankfurt — For this trend mass production is so yesterday and products that hold a story or carry personality move to the forefront. Spirituality comes into play as objects take on a deeper meaning and waste becomes a material resource. Paired back design does not mean lack of design. Imperfections add character while the emulation of colors, textures, and forms of the natural world are embedded all around us. Frankfurt — Surrounded with technology and overproduction, this movement leans towards reviving age-old techniques and craftsmanship, giving a fresh narrative to modern design. Authenticity is very relevant and found or recycled materials are incorporated into creations that take influence from the past and present simultaneously. New Age folk adds a splash of color to this rich theme. Worldwide — There is an undeniable shift in buying where quality is trumping quantity and the modern buyer opts for authentic and exclusive products over mass produced goods. Sustainability is also a matter of growing importance. As an industry that thrives on newness, we have a challenge here. Less is more, but what does it mean for the bottom line? During this visit to Tendence it was clearly a smaller show and new introductions were fewer than in the past. Thankfully, this did not stop us from uncovering some gems. Multiple European Cities — Just coming back from a summer vacation? Perhaps the topic of Christmas is a bit shocking, but since we are just returning from Tendence it is the perfect time to discuss the wintery directions we witnessed. Walking around the show floor one might think that spring and winter actually got confused this time around. Colors for Christmas feel more like the palette one would use for Easter. Frankfurt — What part do shop windows play in the marketing mix of department stores, chain stores and specialist retailers? Window dressing is growing momentum as a communication tool and a method for distinguishing stores from other retailers. An emotional and visual appeal to customers signifies a significant chance for the bricks-and-mortar shops. At Tendence expert Karin Wahl shared some tricks of the trade. Worldwide — So what is in store for this newsletter? It is oozing with novelty that visitor’s to MoOD will be able to see firsthand in the Trendease curated selection of the Innovation Platform, September 10-12 in Brussels. We love to show you designs avant premiere as much as you like to view them! So here goes nothing! Subscribers can enjoy full-resolution images of three dozen materials within. London — One of the must-attend events of LDF is Designjunction where over 150 international brands will exhibit their latest wares in the former 1960’s postal sorting office. To get you excited for what’s to come, subscribers can see an in-depth preview of what can be found the Sorting Office on New Oxford Street here. While on the topic of LDF, Trendease will be participating in some pretty nifty events: a talk at Designersblock a Tokyobike tour! Paris — This week has been overflowing with events we attended so far at The Dock, 100% Design, designjunction, designersblock, Tent, the Shoreditch Design Triangle, and that doesn’t cover the five shows in Paris: Première Vision, Indigo, Expofil, Le Cuir à Paris, and Mod’Amont – phew! In this week’s gallery subscribers will find oodles of examples of leather and fabrics geared towards the 2014/2015 Autumn and Winter trends. Frankfurt — This week’s gallery is all about the trends to be presented at Ambiente in February 2014 under the theme “Sovereign Composure”. Once again the members of bora.herke.palmisano design studio have envisioned four directions for the consumer goods markets, which will come to life in vignettes at the fair by use of products available through the exhibitors. Subscribers can see a preview of the trends, including Pantone color references within.